2014 Prescott Valley's 18th Team up to Clean up's largest volunteer group- SHINPU-REN from 3yrs to 50 these guys worked their tails off today for 3 hours filling 30+ bags and cleaning up piles of debris to help improve our town- Way to go you guys you really make us proud! It's a group effort to uphold our responsibility to keep this earth clean and Shinpu-Ren Family Karate students and parent are setting a fine example. 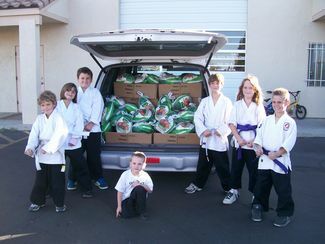 November 25 - Dojo students raised enough money with their 8K Hike for the Yavapai food bank to provide 330 Thanksgiving canned goods, 30 turkeys and a cashiers check for $1,000.00 Not bad for a bunch of kids! Learning about civic duty and giving back to their community is an important part of their training. As a reward they all got to participate in a Dojo overnight sleepover that was to say the least a BLAST! 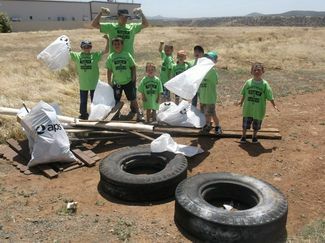 May 4 - 20 Students, parents and instructors showed up to help Clean Up Prescott Valley. 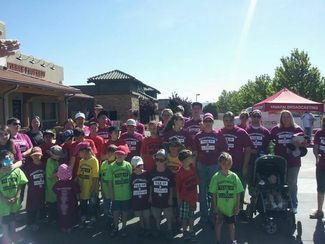 Team Up to Clean Up is sponsored by The Prescott Valley Chamber Of Commerce and others to help remove the trash and debris cluttering the roadways and open fields around town. ShinPu –Ren considers this to be a valuable community Service, and we make it a point to turn out a great team of participants to help in this endeavor. 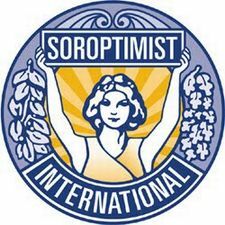 April 27 - Reach for The Stars is sponsored by The Soroptomist International of Prescott. It is a day of empowerment for young women. The focus is on Self esteem building, perceptual distortions, teamwork, and loving and appreciating their bodies. The young women learn that bullies behave the way they do because of their own low self image. Participants learn that dreams can and do come true. ShinPu -Ren volunteers to help teach some self defense to the young women that attend. Beginning January 2013 the FREE Women's Self Defense Class took on a New personality. GET K.I.S.S.D. , Keep it Simple Self Defense. With a newly re-vamped format, the Free Women's Self Defense 2 hour class has turned a corner. As always, the 2 hour Defense Seminar is always FREE to all women ages 13-adult. This class is offered to women from all over Prescott Valley and all surrounding areas as a community service. ShinPu-Ren is a strong supporter of women having the needed tools to stay safe out in the world. Now we have streamlined the process down to keep basic defense skills easy to remember, working from the ground up, ladies are run through a series of simple drills and techniques designed to promote awareness and assertiveness, verbal and physical skills. At the end of the 2 hour class a new feeling of self assurance is shining through the participants faces. However that's not where it ends. For some women the 2 hour class is as far as they want to go, however a number of others want more, and now they can get it. Get K.I.S.S.D. has become a total of a 5 week (2 hour class included) program that will take women through numerous aspects of various dangerous situations and attacks, while all the while keeping every technique as simple and basic as possible. 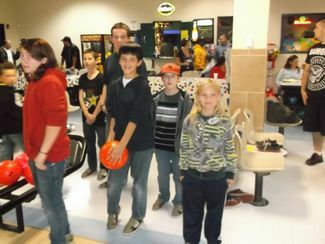 25 Students showed up at Antelope Lanes to participate in the annual Bowl-a-Thon. Theses students had spent the last few weeks raising sponsorships that would be donated 100% to the Yavapai Food Bank Flyin’ High Turkey Drive. This fundraising event is our student’s way of giving something back to their community. Occasionally through the year students go out seeking support for their major competitions. Thus it is so very important that these students and their peers seek to help out persons less fortunate in their community. This particular event has built a great camaraderie among students, they even compete with each other to try and give the most they can. They bowl have pizza and a great time while working together for a common goal. This year they got a head start on the food drive by competing with all of their classes to bring in the most canned goods. The winners had the pleasure of getting to PIE the Sensei of their choice at the Halloween party. Three of the Sensei were repeatedly Pied, much to the delight of the Mighty Mites-the class that won. As we looked upon the abundance of gifts provided by the friends and families and business’s who sponsored our students for this event, we couldn’t help by feel a sense of awe. Students as young as four years old were sponsored for their annual Bowl-a-thon in order to accomplish their goal. Learning to give back to their community that supports them frequently throughout the year is a requirement for students of Shinpu-Ren. This event is a perfect way for them to have the experience of working together toward a common goal in which they receive above all the benefit of giving to others. 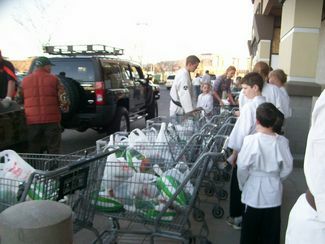 On Monday November 19th students loaded up the cars with their food gifts and with their families delivered to the Flyin’ High Turkey Drive, 250 count each, potatoes, gravy, green beans, cranberries, corn, stuffing, assorted vegetables and broth; 1,836 packages in all, followed by 72 turkeys and a check for $100.00. 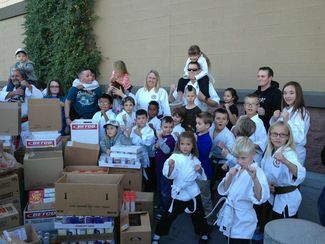 The Mighty Mites, who are the smallest of the Dojo students, actually raised the most this year, and they were quite excited when it was explained to them how many families they helped to provide a Thanksgiving meal for. 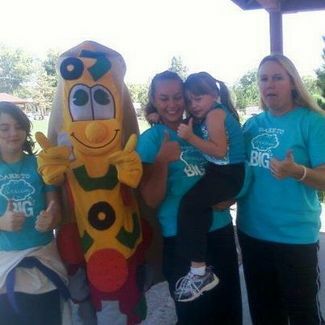 Dare to Dream Big was the motto for this years Girls in Sports Day. 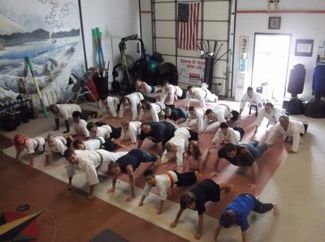 Three awesome SPRFK students assisted the Sensei with the all day event. Mackenzie, Dani and Makenzee were great helpers and Uki during each of the classes. This event is hosted by the YMCA to inspire young girls to develop an interest in a number of different sports. Instructors from all around Prescott for Soccer, Yoga, Cheer, Gymnastics and of course KARATE come in and instruct in their particular specialty. Every hour groups of 15+ girls would rotate in for one hour of training in numerous aspects of self defense, anti bully techniques and personal awareness. Every group participated with great enthusiasm and seemed to have a really good time, everyone received T-shirts, caps, and backpacks stuffed with goodies. This was a good opportunity for the Dojo girls to work on their teaching skills. Community Responsibility was a great lesson learned for students that participated in the Prescott Valley Team up to clean up event. 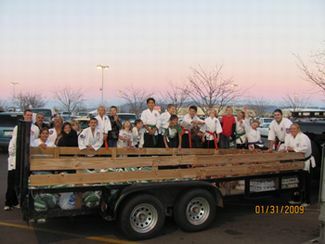 Shinpu-Ren Students worked a very large area of Prescott Valley on this day. Cleaning up large amounts of trash from the Circle K area around Hwy 69 and Prescott East Hwy, down both sides of Prescott East Hwy, Down both sides of 5th st, and both sides of 2nd street all the way to Glassford road. Amazingly while the students were picking up trash a truck went by and taunted them throwing all of their ashtray contents all over the road. It's a good thing they drove off quickly because if the kids had gotten hold of them-Yikes-they were so angry, and then so resolute about personal responsibility and taking care of the community in which they live. This was a great lesson for all. The day was finished up over at the Entertainment District with pizza and prizes for the participants. Beginning in February, Shihan Alex held seminars at both Glassford Middle School and Bradshaw Middle Schools in an effort to open a dialog with students regarding bullying. The seminar was called "Be the Change." Students of all grade levels participated. Students were surveyed and interviewed to get their personal and anonymous input on the problems with bullying in their respective schools. Afterward students were given numerous examples of conflicts, and had to work out ways to handle those situations, intellectually, verbally and physically. Students participated in learning levels of discretion as well as simple non-violent means of self defense. Hosted by Soroptimist International of Prescott, Hanshi James morris and assistant Stephanie teach some basic self defense. Reach for the Stars is a signature program of Soroptimist International that helps promote self esteem for middle school girls ages 11 - 14. Shinpu-Ren has participated in teaching the girls a bit of Self Defense the last couple of years when they have their event. The Activities are geared to be a fun,educational opportunity for participants to do their best and encourage them to live their dreams. 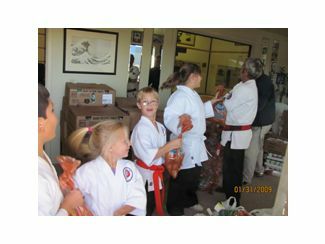 June 16th Prescott Valley Days Exhibition Hall "Tim's Toyota Center" had a full house of Karate Students from ages 4 and up giving the public a taste of all of the many things they learn at Shinpu-Ren. This demo was designed almost entirely by the students. It was run similar to a 3 ring performance with students showing something different in each arena. Defense against armed assailants, weapons and forms demonstrations, ground fighting and Chambarra, were just a few of the areas displayed. 30 min later 7 students performed a group brick breaking as the finale. June 10th Students performed a demo at St. Germaines Catholic Church Spring fling. Student groups designed and performed numerous displays of self defense against multiple attackers with weapons. Students also showed the audience some of the basic drills they go through in class along with bare hand and feet sparring exhibition matches. 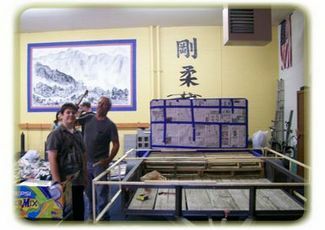 2011 is the second year that the school has entered in the Create a tree event. The name of this years display was “A Black Belt is just a white belt who never gave up”. The tree itself represented all five of the Shinpu-Ren belt ranks, White, Orange, Purple, Green, Brown and Black. The lower more abundant branches represented the white belts, or beginners. 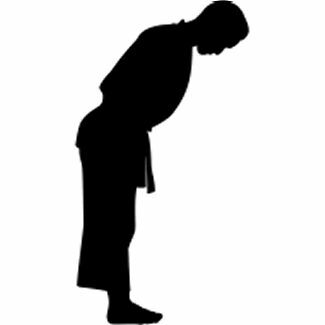 There are always plenty of beginners in any martial arts systems, these are the novice’s who try Karate for one reason or another but who have not yet necessarily developed the commitment to continue through all of the ranks. As the tree pyramids towards the top each represented belt rank color became smaller, indicating how the number of students reduce in proportion to the level of commitment necessary to climb the ranks to Black Belt. The smallest and highest part of the tree was black, thus showing that only the few who persevere and commit themselves to “The Way” make it all the way to the top-Black Belt. Each branch of the tree was decorated with hand made snowflake ornaments adorned with photos of all of the current Shinpu-Ren students and many past students at their best. No two snowflakes are the same, and no two Karate students or Karate journeys are the same. The base of the tree was covered by small floor mats to cushion the fall of any snowflakes that might fall, just like the ones that serve to protect the students in their training. Soroptimist International Day of fun and inspiration for girls "Reach for the Stars" was held at Chapel Rock Camp. Instructors from Shinpu-Ren participated in teaching the girls some simple self defense strategies. This was a really fun experience for instructors as each new set of girls was rotated in every 15 minutes. Some were a bit shy at first but it didn't take them long to catch on and learn a few moves. Once again the wonderful students of ShinPu-Ren have put their best foot forward. As a Sensei it creates a tremendous sense of pride to see the students you train learning and applying the values of giving to others. Students age 4-40+ this year raised enough money with their Bowl-A-Thon to donate to the Prescott Valley Food Bank 20 Full Thanksgiving Dinners and in addition they were able to present a check for $1,000.00 to help with the demand on the Food Bank this year. What a joy and a blessing to have such a dynamic group in the Dojo!! Shinpu-Ren students changed it up a bit this year to raise money so they could contribute to the Flyin' High Turkey Drive. Class discussions brought to light the tough economic situations of many friends and families across the country and here in Prescott Valley. Twenty two of the schools students age 4- 55 participated in a Bowl-A-Thon held at Antelope lanes in order to raise money for the cause. 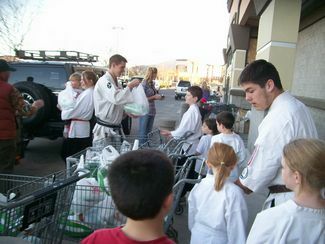 After a great deal of shopping and thanks to the helpful friends at Fry's, two days later students pulled into the Fry's parking lot in Prescott Valley with their gifts to the community. The students this year donated 200 turkeys, 200 boxes of stuffing, 200 bags of potatoes, 200 cans of vegetables, 100 cans of cranberry sauce, 100 packets of gravy and last but not least a cashiers check for $200.00. The energy and effort of the students and their families this year was tremendous and as their instructors we are very proud of them.. The First Ever and hopefully the First Annual Tail Gate Trick or Treat Event held by Shinpu-Ren Family Karate was a huge success! The crowd was estimated at 1,200 or more! 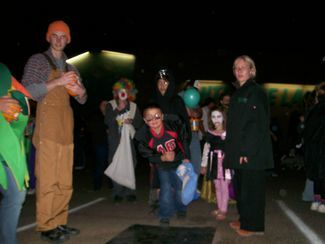 Local businesses turned out with Great Spirit to help the kids of Prescott Valley celebrate one of the favorite nights of the year-HALLOWEEN Ghosts, Pirates, Clowns, Princesses, and creatures of all shapes and sizes were able to do their Trick or Treating in a safe and fun family environment. Company vans and cars and trucks were decorated in an amazing display of fun and imaginative spooky decors. 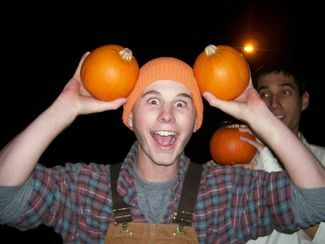 Gary from Just ask Rental took home the Great Pumpkin Award for his efforts to make the event so much fun with the giant bounce slide with a light show, cotton candy for the kids and a great sound system that pumped out music and spooky sound effects through the evening. People’s choice awards went to Truly Nolen, Trinity Lutheran and Critter Clippers for their wonderfully fun décor of their vehicles. There was candy and balloons, games and prizes for all of the kids. We would like to thank all of the local business that participated with us and helped to keep the P.V. kids safe this year. This years car wash efforts to raise money to purchase turkeys for the annual turkey drive were even more successful than last year! 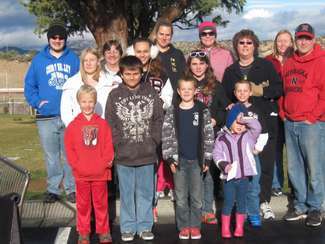 Students turned out on two separate Saturdays to clean up the cars of Prescott Valley. 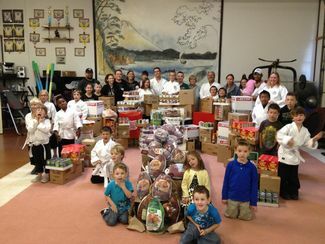 When all was said and done we were able to donate 100 Jenny O Turkeys for the Thanksgiving Turkey Drive. Thanks’ to the co-operation of Fry’s Food Stores managers the purchasing process was much easier this year also. 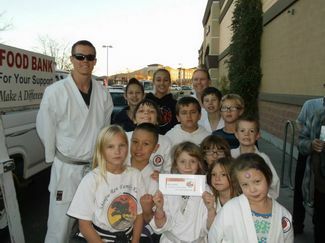 This is a favorite event for the students of Shinpu-Ren Family Karate. It gives the students a means to give back to their community, and to work together for a common good. Students learn how giving of themselves for the sake of others can be a most gratifying endeavor. 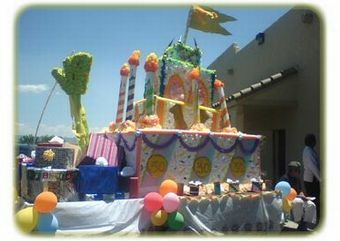 Shinpu-ren students decided to really go all out on this years Happy 30th Birthday Prescott Valley Day’s Parade. 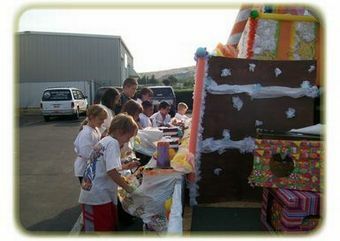 The students started the work on the 2008 Prescott Valley Days Parade float 6 weeks ahead of the deadline. Numerous hours were spent wrapping boxes, twisting thousands of little tissue paper flowers, painting and gilding the fantastic 16-foot tall birthday cake float. The many students and a handful of moms painstakingly tended to every detail, from the hand painted plates and cups to the individually hand painted slices of cake. Student’s hand wrapped bottle caps into pieces of foil for candies and made tissue paper flowers by the dozens. There was even a hand made piñata of the letters P.V. hanging in the front of the float. The last count on glue sticks used for the project was 160 extra long sticks. As the float rolled out the doors of the dojo Shihan Alex and Marranda Walker put on their clown suits and their 3ft. stilts to walk the parade route. 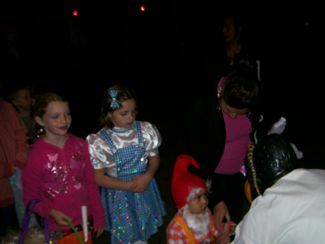 Many students were dressed up as presents and three more as clowns to hand out candy. Some of the bigger students formed a drill line to perform kicking drills along the parade route. All of their hard work paid off on the day of the parade though when the students and school came away with the FIRST place prize for the youth division. This was a really fun and successful project for the students and the school. The best part though was when they got to tear it down a few days later. Ribbons and tissue paper were flying everywhere, and in a matter of 30 minutes it was gone. 2008 Car Wash Fundraiser to benefit Prescott Valley Food Bank Flyin’ High Turkey Drive. Students got together and decided to hold a car wash to see how much money they could raise to purchase turkeys for the Turkey Drive in Prescott Valley. After a long day of scrubbing cars in front of the Western Wearhouse, and with generous support of supplies by Checker Auto, the students raised a grand total of $311.00. Thanks to Fry’s Food Stores, they were able to turn that into a donation of 60 turkeys, for the Flyin High Turkey Drive on Monday November 24th. 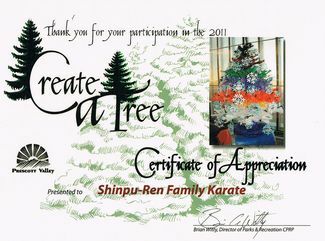 Shinpu-Ren entered the Create a Tree- Holiday Tree Display event at the Civic Center in Prescott Valley. This was the first time they have entered this event. The students got together and built a large paper Mache tree base / trunk. After this part was completed they took the branches from an old artificial Christmas tree and fashioned them into branches for a very oversized bonsai style tree. All of the photo decorations were handmade by the students. Sparkly pipe cleaners and Popsicle sticks made wonderful photo frames. The tree had old sparring gear, belt rank colored ribbons, small trophies and medals, and hand made karate ginger bread men. The trunk was tied with real belts and the tree topper was a stuffed eagle. 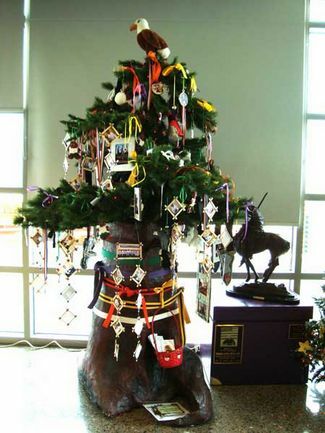 The tree was named “The Shinpu-Ren Tree of Champions” in honor of all of the students who attend the school. Happily the tree was selected as the favorite and won the Peoples Choice award, which really made the students happy. The students also put on an impromptu demo for the visitors in the Civic Center, the evening of the big Prescott Valley Electric Parade. 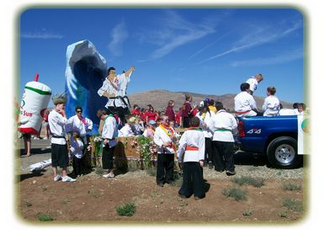 Shinpu-Ren students chose to represent their school in this years Prescott Valley Days parade with a theme that represented the “Shinpu-Ren or Gods Divine Wind” Tsunami wave from legendary stories of the first Mongol invasion of Japan in 1274-1281. Fortunately since the parade theme was Hawaiian vacation the selected theme blended in even better than expected. The float itself was a 14 ft. tall Paper Mache tidal wave with two Karateka fighting just underneath. Students worked for weeks on end plastering soggy newspapers up over the chicken wire frame. An evil looking Samurai was hand painted into the water on the backside of the wave. 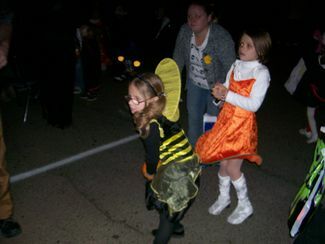 Smaller students lined the front of the float to wave to parade goers. The float was skirted by grass and covered in ferns and cherry blossom flowers. Students wore flower lei’s around their necks and had a great time following the float along performing kata’s and kicking drills and handing out candy. At the end of the day students were presented by the Prescott Valley Chamber of Commerce Representative the Youth Division SECOND place trophy.